Where do Amish go shopping? Despite perceptions of the Amish as an isolated society, Amish do participate in the economy and purchase a wide variety of consumer goods. While they do grow a large portion of the food they consume, Amish also purchase food and other products in a variety of venues, including salvage stores, Amish-run dry goods shops, and even large supermarkets such as Wal-Mart. 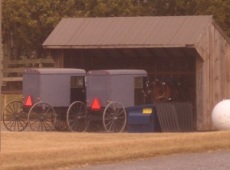 Typically in most sizeable Amish settlements, there is at least one salvage goods store. Salvage, or “bent ‘n’ dent” stores, may sell damaged items, or items near or past their expiration dates. Amish appreciate the good deals they can get on foods that are typically consumed quite quickly in large Amish households. The shops are an outlet for food that would otherwise go to waste, thus the Amish also appreciate the fact that they may be using products that would otherwise be disposed of. Salvage stores play an important part in the local economy. Numerous Amish businesspeople operate such stores, which are patronized by Amish and non-Amish alike. Most Amish communities also have at least one dry goods store, where one can purchase writing supplies, books, supplies for canning, flashlights and other lighting implements, and fabrics in some cases. Dry goods stores are typically run by Amish or Mennonites, and like many Amish-run shops, inhabit a small building at a home property. Spector’s is a fabric chain store found in numerous Amish communities. Though some Amish today purchase clothing off the rack, many Amish women still make clothing for their families, and in particular, dresses. Spector’s carries a wide variety of fabrics and related supplies. A light selection of books and greeting cards is also commonly found at Spector’s stores. Amish who live within striking distance of Wal-Mart are likely to take advantage of the low prices and bulk sizes available at the iconic superstore. Amish do not have moral issues with shopping at large retailers, viewing it as a matter of practicality and economy. It is not uncommon to see long rows of Amish buggies lined up at the buggy rails outside of Wal-Marts and other stores in Amish areas, and to frequently find Amish shoppers in the aisles. Even for those Amish who do not live nearby, it is common for Amish to hire an “Amish taxi“, typically a van, in groups to go on a once-a-month shopping trip to Wal-Mart or other stores. Amish buy everything from food to clothing to household amenities at Wal-Mart. 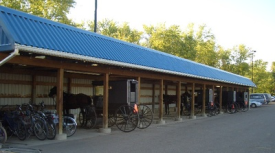 Auctions are a highly popular venue from Amish, and take place in a variety of venues. School auctions help to raise money for the operations of Amish schoolhouses. Benefit auctions provide funds for mission work carried out by Mennonite groups. The Haiti auctions, taking place in Pennsylvania, Ohio, Illinois, Indiana, and Florida, are long-running events supported by Amish, Mennonites and the surrounding community. At Amish auctions, one can purchase and sell everything from hunting gear to quilts to furniture. Some auctions specialize in a particular type of good, such as farm equipment or buggies. Similarly, Amish attend estate sales, which take place after an elderly individual passes away and personal items and sometimes the home are put up for auction. Amish enjoy auctions as a time to socialize, support a good cause, and get a bite to eat. Typically there are a variety of food vendors on hand, selling everything from hot food to pies and coffee to samples of ethnic Haitian dishes in the case of the Haiti auctions. The auction is simultaneously a social event, fulfills a commercial function, and often also supports a good cause. Amish purchase products by mail order, evidenced by the large number of advertisements found in Amish publications such as the Budget and Raber’s Almanac. Some Amish are avid hunters, and may even shop at places like hunting retailer Cabela’s, either by mail, or by visiting one of the retailer’s store locations. Despite perceptions to the contrary, Amish do participate in the economy, and acquire their consumer goods in a variety of places. Some of those establishments are typically operated by Amish or Mennonites, such as Spector’s or salvage stores, while Amish also patronize large retailers such as Wal-Mart. The availability of more disposable income in recent years, due to business success as well as well-paying jobs in manufacturing, has allowed the Amish more money to spend, and a generally higher standard of living than their predecessors of a generation or two back. Amish Online Encyclopedia: Do Amish use banks? 8 responses to Where do Amish go shopping? We were back around Hutchinson, KS (our “hometown”) over the holidays to visit family and saw many Amish people and Old Order Mennonites in the town’s mall and at Walmart. We had forgotten just how many shop in town. However, you don’t see the horse and buggies usually — most come with non-Amish friends who drive, or hire a driver. We also drove over to Yoder, KS (an Amish area) and stopped in at several of their stores. It is always fun to do that — you see lots of things not usually seen in hardware stores for sure! One of our favorite pieces of furniture is a jelly cabinet we bought in Yoder the first year we were married (33 yrs. ago). The piece is just beautiful, and has held up over several moves to many different states over the years. "Welcome To The Amish People"
The Amish have moved into our area and I love seeing them and their buggies.I so love them.I read all about them in books and have learned what good people they are.I welcome them with open arms into our communities of Pittsfield and Edmeston, New York and a few others in other towns near by.I look forward to hopefully having them in my town of Columbus, NY soon. Springfield,within 40 miles of Seymour MO (Webster Co. Amish) has an Aldi’s that I see Amish families with their Amish Taxi driver quite frequently. They love a Dollar General too ! I love shopping at B B’s , I live right around the corner …It saves me so much money shopping there and most of what I buy is still in date til next year. They have refrigerated room and a freezer room. they have jackets you can put on cause it is COLD in there… I saved my daughter $23.00 on in date specialized formula for her baby, regular $29.00 I got for $6.00… It was a blessing. Does anyone know where I can find windsor crepe fabric ? Sometimes the Amish will go to certain farmers’ markets not only to shop but to sell, trade or perhaps bring their surplus produce or perhaps home-baked goods to market. Meadville, Pennsylvania had one years ago and may still be active today. There are a number of Amish communities in the Meadville area generally which explains the popularity of that particular market. Leave a reply to Where do Amish go shopping?